Nissan has announced that its Leaf electric vehicle will be available for short term hire in London through partner Europcar. “There are two distinct reasons for joining forces with Europcar to introduce Nissan Leaf to the short term rental market,” said Guillaume Cartier, vice president for sales operations at Nissan. “The first is obvious: with its absence of tailpipe emissions and an outstanding driving pleasure, the Nissan Leaf is the perfect car for the inner city. “The second is for drivers currently unsure whether an EV is suitable for their needs. The Nissan Leaf has a range of around 110 miles (175km), which is more than 90% of UK commuters drive in a day. 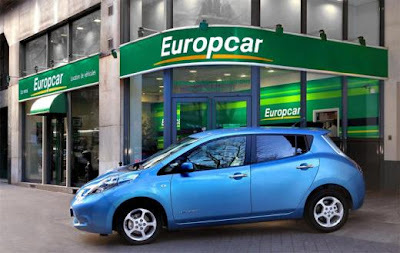 In order to make hiring the Leaf simpler for customers, Europcar will recharge it free of charge, even waiving the standard service fee usually made for vehicle refuelling. For total peace of mind, customers can call a Nissan Hotline with any queries they might have about the vehicle, plus, at the end of the hire every customer will be surveyed by Europcar with feedback used to help shape future generations of Nissan electric vehicles. Ken McCall, managing director, Europcar UK Group said: "Hiring a Nissan Leaf could be the ideal option for motorists keen to reduce their fuel costs and avoid congestion charges. The pilot scheme, which will initially run for three months, forms a definitive agreement between the two companies, and follows a Memorandum of Understanding in which both organisations undertook to investigate ways of jointly promoting the concept of emission-free motoring. Success of this scheme could potentially see it widened to other cities.